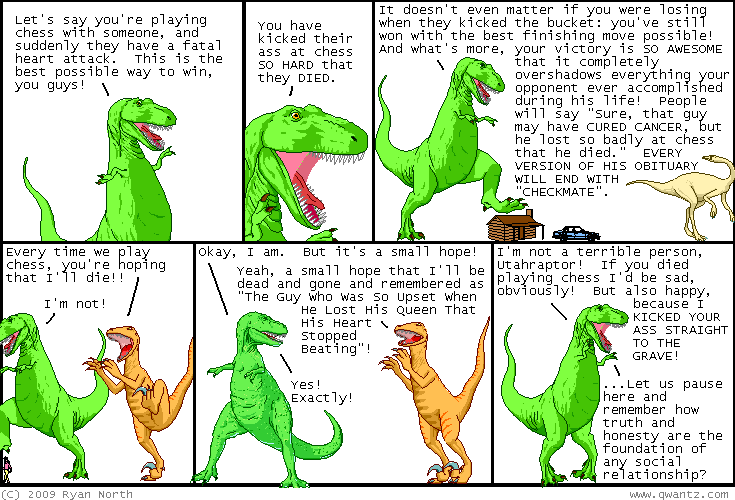 Dinosaur Comics - January 12th, 2009 - awesome fun times! –"PREPARE YOURSELF FOR DETECTIVE ADVENTURE" Sherlock shrieks! January 12th, 2009: Bill emailed me something he'd made using service I've never heard of called "Xtranormal", which apparently is fed text and spits out a movie via some stock characters and text-to-speech. The result when applied to yesterday's comic is hilarious and surreal. It's like watching robots fall down the stairs! One year ago today: i looked up what people call paris hilton ("socialite" seemed a bit imprecise) and wikipedia calls her a "celebutante"! now there is a word for you!